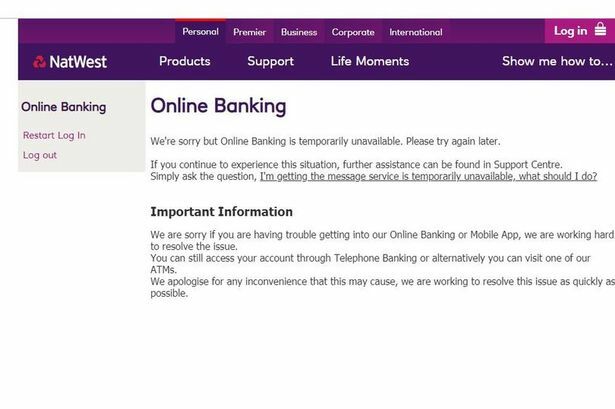 First HSBC now Natwest and RBS experiencing online problems. Are the controllers running some tests to see what effect crashing the system will have.? I wonder how banks might benefit by temporary "freezing" the system -if only for day ? Im sure were getting fleeced by the length of time it takes us to go through automated phone systems so i can imagine the ptb thinking up ways in which to squeeze extra pennies/pounds from us. I would suggest a boycott of all online banking. Entrusting ones finances to the internet is obviously not a sensible thing to do IMO. The computer meltdown at NatWest and Royal Bank of Scotland, which left millions unable to access their salaries, could stretch into next week it emerged today. The banking group will open 1,000 branches on Sunday, from 9am to midday, as millions of people are unable to receive money or pay bills because of an ongoing technical crash. Doors were also kept open until 7pm on Friday and until 6pm today because a huge number of transactions failed to go through properly. The problems with account access now rank as one of the worst technical failures at a British bank. Up to 12 million people have been affected by the major computer error which was triggered when a software upgrade was being installed to the payment system. They have resolved the 'underlying problem' but it could be early next week before all the problems have been dealt with and all payments catch up. Susan Allen, customer services director for RBS-NatWest retail, told ITV News it was difficult to say exactly when all the problems would be resolved. The systems failure, which the company now says began on Tuesday, meant that payments due to be made on Wednesday night, ready for Thursday, did not appear in account balances. As a result, some customers were blocked from taking money out of cash machines, while others had internet supermarket food deliveries stopped after payments were rejected. Some people could not use debit cards at tills, including hotel check-out desks, airports and petrol stations. Some customers were able to access their money by 4pm Thursday but problems have persisted and customers continued to report being unable to access their cash this morning. It is unclear whether the problem that stopped payments due on Wednesday night have also blocked payments due for last night. A statement on a NatWest feedback website said today: 'Unfortunately we are once again experiencing technical issues with our systems and account balances have not updated properly overnight. This means where money has gone into a customers account, there may be a delay in it appearing on their balance. 'We can assure our customers that this problem is strictly of a technical nature and we continue to work hard to resolve this. The company also confirmed the problems were not the result of an external attack on its systems. RBS, which conducts retail banking under the NatWest, Royal Bank of Scotland and UlsterBank brands, kept 1,000 of its branches open until 7pm last night to let people take out some money, and opened them earlier today, in order to assist customers. At 8am today, an RBS spokesman said the bank was preparing a new statement to update customers. This time accounts were debited twice - methinks they take the mick! NatWest has revealed that some customers "may be having issues with online banking and their debit cards." Some customers may have issues with their Online Banking and using their debit cards at the moment. Working as hard as we can to resolve.. Many customers who have experienced problems have taken to Twitter to talk about them. just had my card rejected yeah good one #natwest sort it out sharpish! Natwest down again, money transfered between accounts missing, can't use my card to make payments. This is 2012, right? In June, the bank suffered major technical problems and millions were left unable to withdraw money, check their balances or make payments. Meanwhile, the Nationwide Building Society has apologised after admitting that some customer's accounts were mistakenly debited twice. It said the problem was caused by "human error" and meant some customers who used their Visa cards on Tuesday had duplicate payments also taken out on Wednesday. Nationwide told ITV News' Consumer Editor, Chris Choi that 704,426 accounts have been affected. We have identified an issue where some current account card transactions made on the 24th July were duplicated on 25th July. This is a one off isolated incident and is down to human error. The duplicated transactions will be corrected overnight. We would like to apologise for the inconvenience this has caused and we can assure customers that should they incur any related charges these will be refunded in full. Can't believe @asknationwide no warning at all and cancel my overdraft and now owe £700...thanks for being useless and ruining my savings! They've only been using computers for 40 years. Wonder why this is only happening now. Running out of cash perhaps? Revellers also received a nasty shock when the credit in their current accounts appeared to have been wiped out. The problems, which kicked off from 4pm, affected those with Lloyds TSB, Bank of Scotland and Halifax bank accounts. Halifax and Bank of Scotland are both part of the Lloyds banking group, which has 22million current account customers and received a £20billion bail out during the financial crisis. Fight the system, don't leave an electronic "paper trail" for them to spy on you!! use cash instead, it is quicker than chip and pin. Cheques are still valid for person to person transfers. I'm sure small businesses still accept them. Your case is uncannily similar to a saga investigated three years ago by my predecessor, Margaret Dibben, in which a NatWest customer paid Mark One instead of M&S because of a drop-down menu. The difference is that back then Mark One Mastercard existed; now, no one has heard of it. HSBC tells me it is no longer the card issuer. Internacionale, the fashion chain which took over Mark One in 2009, is unaware of it, as are the Payments Council, Mastercard and the UK Card Association. Which raises the question why Nationwide has an obsolete card on its menus. Under Financial Services Authority rules banks and building societies are required to take reasonable steps to recover a customer's money if they have been misdirected, but are not bound to refund it. Prompted by The Observer, Nationwide picked up the phone again to HSBC and had the brainwave of giving the numbers and sort codes for the account which received the transfer. Armed with these new clues it located the money and returned it. "The trouble was, we were looking for a card or account in the Mark One name," said an HSBC spokeswoman. "Faster Payments, which this transaction was, are irrevocable. Any attempt to reclaim funds as a result of an error are subject to a debit authority from the beneficiary. We contacted the beneficiary on a number of occasions and have now received the authority to return the funds." Nationwide is liaising with Experian, which administers its drop-down menus, to ensure they are kept up to date. The Payments Council wants anyone who has had funds misdirected to contact it via its website. If you need help email Anna Tims at your.problems@observer.co.uk or write to Your Problems, The Observer, Kings Place, 90 York Way, London N1 9GU. Include an address and phone number. Probably worth noting that once your money is in the bank, it is legally no longer 'your money', but the bank's. How about this for a financial warfare exercise? Financial markets were thrown into turmoil on Friday as the Bloomberg terminals used by hundreds of thousands of financial industry workers went offline in an unprecedented global outage. The glitch put the Bank of England and European Central Bank on alert, and saw a £3bn auction of UK government debt postponed for hours. Oooooops! "could last for days"
Around 600,000 payments have gone missing from the current accounts of NatWest, Royal Bank of Scotland, Ulster Bank and Coutts customers. Benefits and wages have not appeared in accounts and some customers have also complained direct debits which were due to leave their accounts weren't processed, prompting fears people would be charged for late payments. Worse, customers might have to wait until SATURDAY for their payments to appear. "We have fixed the underlying issue, we apologise for the inconvenience caused and we are working flat-out to get these payments updated for our customers no later than Saturday,” an RBS spokesman said. "To any customers concerned about the implications of this issue we advise them to get in touch with our call centres or come into a branch where our staff will be ready to help. "We will ensure no customers are left out of pocket as a result of this issue." But this response was far from enough for many of the bank's customers. "Another day, another failure. No I don't want to go to the branch, I don't want to spend hours on the phone. Just want my money," Sam Sargeant wrote on Twitter. Single mum-of-two Katie Nesbit, 30, from Greenwich, London, was left unable to do her food shop after her £115 child tax credit payment failed to reach her Natwest account. "I have spent money expecting the money to go into my bank this morning and it is just not there,” she said. "I was going to go food shopping. It is understood problems began on Tuesday when some customers were unable to use online banking or apps. Other customers said payments which would usually be expected in the early hours of Wednesday did not reach their accounts. RBS has said it's identified the problem, but if you think you're at risk you should call them. “If you need cash urgently you call 03457 888444, or visit your local branch,” the bank said. People are also advised to contact anyone they expect money to be sent to. “If you’re a Natwest, RBS, Coutts or Ulster Bank customer and have a payment coming up, it’s worth contacting the company or person you’re paying so that they’re aware of the issue," said uSwitch.com money expert Nicolas Frankcom. And if that's not enough, you can always switch to a new bank, there are even some rather nice incentives available at the moment. several of the DWP automated phone numbers had a reference to Natwest and RBS customers referring them to another number. Obviously people on benefits etc been phoning the DWP a lot. The RBS group has suffered a string of IT glitches and meltdowns during the past few years. NatWest and Royal Bank of Scotland customers have reported having their debit cards declined in shops and at ATMs after the banking group was hit by yet another technical glitch. The problems emerged at around 12.45pm on Friday, just as many people were popping out to buy a sandwich or do some lunch-hour shopping. The problem coincided with payday for many people, and customers voiced their frustrations on the banks’ Twitter and Facebook pages. Meanwhile, John Paxton wrote: “When will this issue be resolved, I am currently in Palma and unable to get cash out! I don’t feel this is acceptable. @NatWest_Help when will this issue be resolved I am currently in Palma and unable to get cash out! I don't feel this is acceptable. The problems are affecting customers of NatWest, RBS and Ulster Bank, and come a fortnight after Andrew Tyrie, chairman of the Commons Treasury select committee, spoke out about bank IT system failures and the impact they were having on customers. “Banks continue to suffer failures and breaches of their IT systems, exposing millions of customers to uncertainty, disruption and sometimes distress. We can’t carry on like this,” he said. He added that responsibility for good IT systems was often lacking at the highest levels of management, “and ultimately customers pay the price”. The RBS group has suffered a string of IT glitches and meltdowns during the past few years. On New Year’s Day this year, debit card holders reported having their cards declined at tills and their pins blocked. In September 2015, NatWest and RBS customers were hit by a technical problem that meant some could not withdraw cash or use their card in branches. In July 2015, customers were locked out of their online bank accounts for nearly an hour, which RBS blamed on a cyber-attack. A month earlier, many were left without funds over a weekend after 600,000 transactions were delayed for several days. NatWest has apologised after users of its online banking services were left locked out of their accounts. It's said to be affecting access to users of the bank's website and mobile apps. Telephone banking is still available claims Natwest, reports Manchester Evening News. In a statement sent to customers the bank said: "We are sorry if you are having trouble getting into our online banking or mobile app. "We are working hard to resolve the issue. You can still access your account through telephone banking or alternatively you can visit one of our ATMs." Some customers trying to access the website are seeing a code reading 'HTTP Error: 502', or a message saying 'online banking is currently unavailable'. The glitch came a day after some Barclays customers were left struggling to log in to their accounts due to a technical problem.